Sonic the Hedgehog is by now a globally recognised icon, but even the most bombastic of icons has to have a humble beginning, and Sonic's story begins in the appropriately titled 'Sonic the Hedgehog', often affectionately known as 'Sonic 1', being the place where it all started. Originally released on the Sega Mega Drive/Genesis in 1991, it has since been ported to a large number of other outlets and devices, most recently in 2013 for mobile devices in a remastered edition. A game over 25 years old is still in demand, still widely played and recognised by gamers and casual players alike. Sonic the Hedgehog was a defining game at the time, mainly because of the tease of incredible gameplay speed but also because of how solid it is. It was pegged to be a major platforming giant, enough to rival Nintendo's Super Mario Bros. series, and as a result Sonic the Hedgehog not only takes inspiration from other platforms but ends up changing the game, adding its own unique spin on things, if you pardon the pun. Sonic the Hedgehog is tasked with stopping the villainous Dr Eggman (or Dr Robotnik if you prefer) from stealing all of the chaos emeralds, as he would do something nefarious with them no doubt. Sonic must travel through six different levels, called 'zones' in the Sonic universe, each with three acts each, splitting big levels in three with a boss fight at the end of the third act. Players hoping to just speed their way to victory in a game promoted for its speed may not get exactly what they hoped for, however. Sonic's speed needed to mix perfectly with the level design, to give a sense of speed to the game but also keep it interesting to play. The question at the time was 'Can Sonic the Hedgehog deliver on its promise of blistering speed?' and the answer is not quite. It does move understandably fast, especially in the opening level. Sonic the Hedgehog does hit a platforming stride soon after the opener, slowing things down considerably in order to give you some good old fashioned platforming sections. 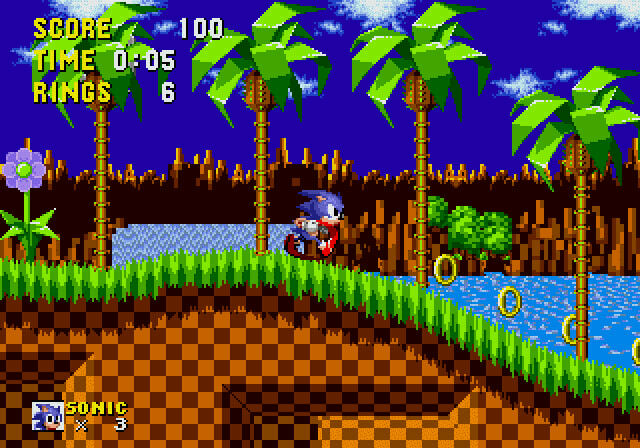 Marble Hill Zone and Labyrinth Zone, for example, both contain tricky precise jumps and weaving platforms that slow Sonic down somewhat, Marble Hill Zone being only the second level in the game. The game deliberately slows you down, making you take your time throughout to enjoy the level design and the music, but you notice these platforming sections immediately for slowing the pace down. In the first game of a series that promotes speed over everything else, teasing people with what could have been is an interesting tactic. Control wise Sonic 1 does handle very well. The controls are simple, again a similarity to other platforming games at the time. Running and jumping are really the only moves in the game, the only ones you need. Further titles in the Sonic series add more little ideas and gadgets for you to use, to compliment trickier and more complicated level design, but this first title keeps things simple. Moving with the directional pad and jumping with any of the face buttons are all the controls this game needs. A highlight of the series that has run through pretty much every game since, is its superb musical score. Songs are catchy and intricate, and the music will keep you coming back to play again just as much as the level design and the tease of extreme speed. You are guaranteed to get one of these songs stuck in your head, and each theme compliments the stage it represents well. The Scrap Brain Zone theme is chaotic and metallic sounding, a sound that goes well with the level itself, full of mechanical traps and ways to see your little blue character fall to his death. For the first game in the series it is understandable that it may not be perfect, although it does hold a lot of nostalgic charm and does still hold up today. The controls are simple and easy to pick up and play, but not quite as refined as they will later become. The speed is there, it's just difficult to achieve it when you want it, and sometimes you become a little too bogged down in platforming. However, Sonic the Hedgehog remains a classic title, and for good reason. Still a solid platforming game with a great soundtrack. I've been writing short stories for years now, guys. You've probably read one of mine already, you just didn't know it. Or maybe you did and you didn't like it, who knows. What Makes a Good Pro Team?